The owner of a bundle store in Kota Bharu, Kelantan, Malaysia hit the jackpot when he purchased two seemingly ordinary sacks of secondhand clothes. Wan Mohamad Adam Wan Mohamed bought the two bundles for his business from a warehouse in Wakaf Bharu, Kelantan, on 12 January. 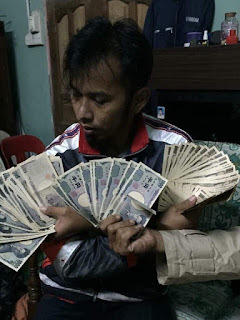 He spent RM100 ($24.41) in total, according to Harian Metro. The 29-year-old was stunned to find something other than old T-shirts and trousers in his new bundles. Laying in a jacket pocket was a wallet containing RM 20,787 (the equivalent of $5073.10 in Japanese Yen). Without any way to identify the original owner of the clothes, Adam had no one to return the money to. So he decided to keep it! He shared the news of his discovery on Facebook on 14 January, and wrote that he will not be selling any of the items in the bundles as they were the "key to my good fortune." Adam revealed that he plans to use the money to grow his bundle business. "I have already converted a few of them to ringgit, and the rest I will save," he told Harian Metro.